Graveyards, Henges, Standing Stones . . . Throughout the countryside of Scotland and Ireland, majestic and mysterious stones give mute testimony to the mysterious past. Although some of them have been removed to museums in major cities, many more are marked on maps as tourist destinations and stand in fields and along roadsides - timeless artifacts from antiquity. On many pilgrimages adventuring through these island nations, I have documented the patterns on the stones, taking rubbings and photographs in both the historic locations and museum displays. It is with great pleasure and pride that I reproduce these patterns. They have weathered the ages to give us clues to the aesthetic and religious impulses of the ancients. 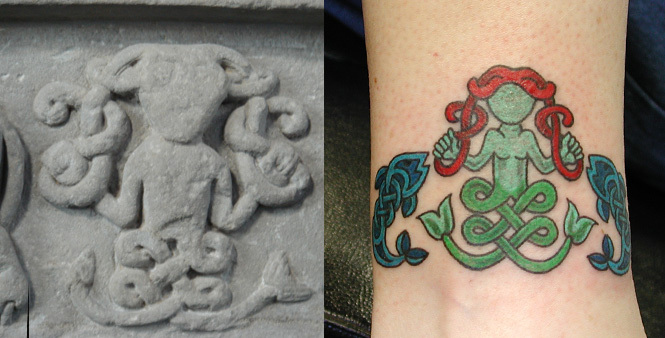 Read on to see some tattoos inspired by these venerable pieces of history. If you weren't looking for Meigle, you'd be forgiven for driving right through it without noticing, but this small village in Eastern Scotland houses one of the most important collections of early medieval sculpture in Western Europe. The Meigle Sculptured Stone Museum is a permanent exhibition of 27 carved Pictish Stones dating from as early as the 8th Century. One of them features this charming split-tailed mermaid design. This design is taken from the center of the Aberlemno Stone Cross, in the graveyard of a small parish church in Angus Scotland. The pattern consists of a completely interlocked series of seven triskelions, the Celtic triple spiral design that is the alternative to the Eastern yin-yang. I prefer to think of it as a representation of moving energy. 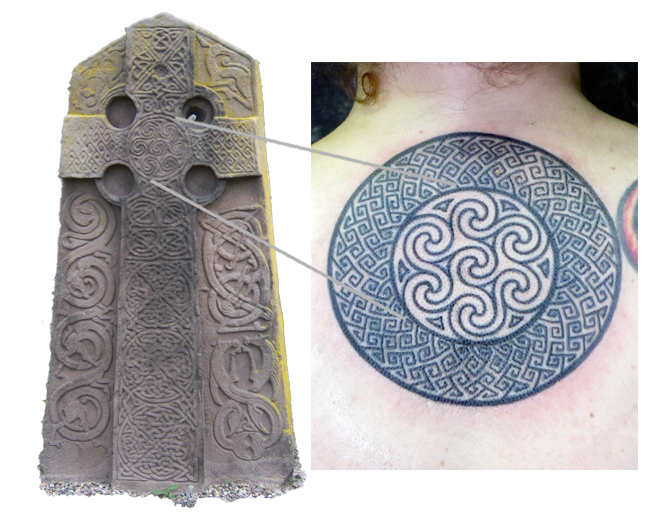 In this custom tattoo, a ring of Pictish key pattern recreated from the "Maiden Stone" (Inverurie, Scotland) was added for a dynamic presentation. Click this link for the original design from the Maiden Stone. The reverse side of the Aberlemno Cross Slab is covered with earlier Pictish carvings. The Picts left such stones all over Scotland, and many of them were later recarved (usualy on one side) with Christian symbols. Check out the Pictish Page to learn more about these ancient Scots and their art. This five-foot high slab of rough sandstone was probably carved in the 7th century CE and is known today as The Dunnichen Stone - named after the approximate place of its discovery in Eastern Scotland in 1811. It contains a beautiful example of the Double Disc and Z Rod Pictish symbol. The tattoo featured here is inspired by the stone and brought to life in skin with clean lines and fine blue dots. Elements from the grave rubbing shown here were used to create this custom Celtic Cross. "Newgrange was constructed over 5,000 years ago (about 3,200 B.C. ), making it older than Stonehenge in England and the Great Pyramid of Giza in Egypt. Newgrange was built during the Neolithic or New Stone Age by a farming community that prospered on the rich lands of the Boyne Valley, Ireland." "Archaeologists classified Newgrange as a passage tomb, however Newgrange is now recognised to be much more than a passage tomb. Ancient Temple is a more fitting classification, a place of astrological, spiritual, religious and ceremonial importance, much as present day cathedrals are places of prestige and worship where dignitaries may be laid to rest." If you are unable to make it to Santa Barbara, you can browse a selection of Stone Inspired Tattoo Flash in the LuckyFish Art Store.